First, make the pastry. If you don’t have enough time, just skip this step and go for shop-bought short crust pastry instead. This recipe makes a double amount of pastry, so you can freeze half. Next time, just defrost it and continue with the next steps! Mix 500 g plain flour and 140 g icing sugar in a bowl. Rub 250 g cubed butter into the flour with your fingers until crumbly. Mix in 4 egg yolks (you can freeze the egg whites and use them for meringues later). If the pastry is still too dry, add 1-2 tbsp water until it comes together. Roll into a ball and divide in half (freeze the other half at this stage). Flatten out the pastry with your hands, wrap the dough in cling film, then chill for at least 30 mins. While the pastry is chilling, make the filling. Beat 5 eggs, 140 g caster sugar, 150 ml double cream and the juice of 2-3 lemons (about 100 ml) together. Sieve the mixture, then stir in 2 tbsp lemon zest (if you don’t like zest in your tart, you can just leave it out and add a bit more lemon juice instead). 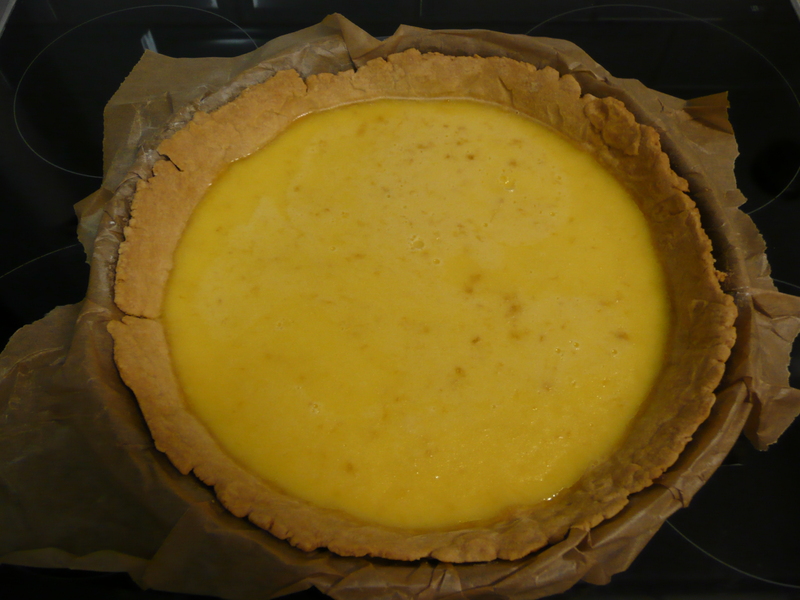 Roll out the pastry on a lightly floured surface to about the thickness of a £1 coin, then lift into a 23 cm tart tin. Press down gently on the bottom and sides, then trim off any excess pastry. Stab a few holes in the bottom with a fork and put back in the fridge for 30 min. Heat oven to 140 C. Line the tart with foil and fill with rice or dried beans. Bake for 10 min, then remove the tart tin from the oven, discard the foil, and bake for another 20 min until biscuity. When the pastry is ready, remove it from the oven and pour in the lemon mixture. Tip: make sure the distance to your oven is not too large: the filling is very liquid so it spills easily. I tend to just partially slide the tin out of the oven and pour the filling in and slide it back. The less I need to walk around with it, the less I can spill (otherwise half is on the floor for sure). Bake again for 30-35 min until just set. Leave to cool (do this in the oven if you are worried it is still a bit too wobbly), then remove the tart from the tin and serve at room temperature or chilled. So if you are a beginner: just buy the pastry, no one will know! The filling couldn’t be easier, just beating everything together, so nothing can go wrong. Enjoy and use up left-over lemons and cream in lemon pudding. Place 500 ml cream (single pouring cream) and 110 g sugar in a saucepan over a medium heat and bring to a simmer, stirring occasionally. Allow to simmer for 6 minutes or until the cream has reduced slightly (I usually don’t really have a clue when that is, also, I’m bad at simmering, I go from boiling to not boiling, to boiling again… that seemed to work too). Add 80 ml lemon juice (from about 4 lemons) and simmer for a further 2 minutes. Pour into cups, glasses or ramekins and refrigerate until set. If, like me, you have little time to allow them to set, you can soak 1 leave of gelatine in cold water for a few minutes, squeeze it very well and stir it into the hot creamy mixture before filling your cups. Serve with fresh raspberries while listening to Lemonade by Alexandra Stan. Use up left-over lemons in a light lemon drizzle cake, a lemon cake, a lemon and poppy seed loaf or a raspberry and lemon mess. 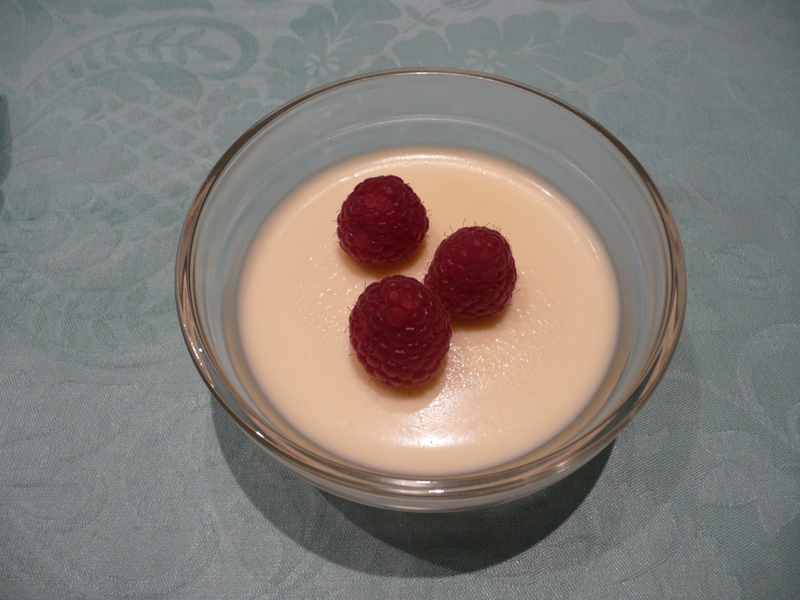 You can use left-over cream in a bavarois, a mango and cardamom panna cotta or a basil panna cotta. 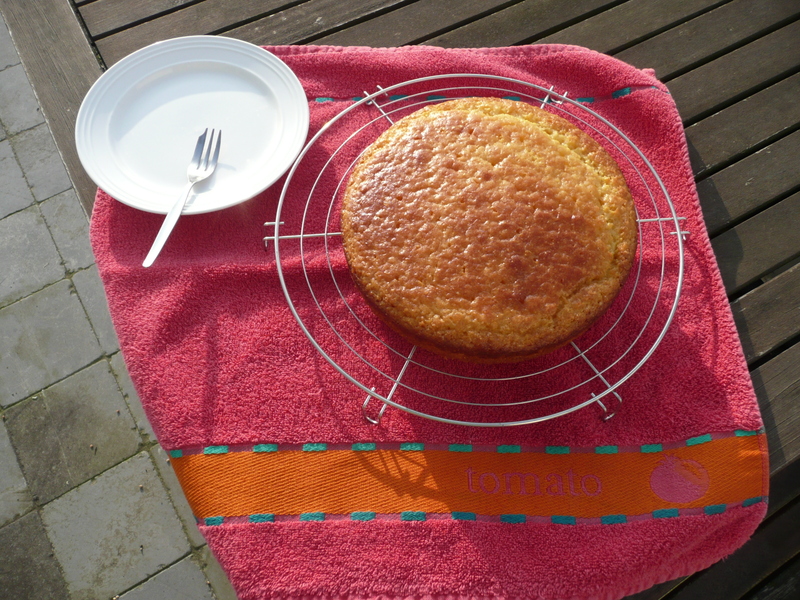 Preheat the oven to 160 C, lightly oil a 20 cm round cake tin and line the base with baking parchment. Put 175 g self-raising flour in a bowl with 1 and 1/2 tsp baking powder, 50 g ground almonds and 50 g polenta (if you don’t have polenta or don’t want to use it, you can use 100 g ground almonds instead). Stir in the zest of 2 lemons (you will need to juice later as well for the topping) and 140 g golden caster sugar. In a separate bowl, beat 2 eggs with 225 g natural yoghurt. Make a dip in the dry ingredients and pour the yoghurt mixture in the dip followed by 75 ml rapeseed oil (if you can’t find rapeseed oil, use sunflower oil instead. 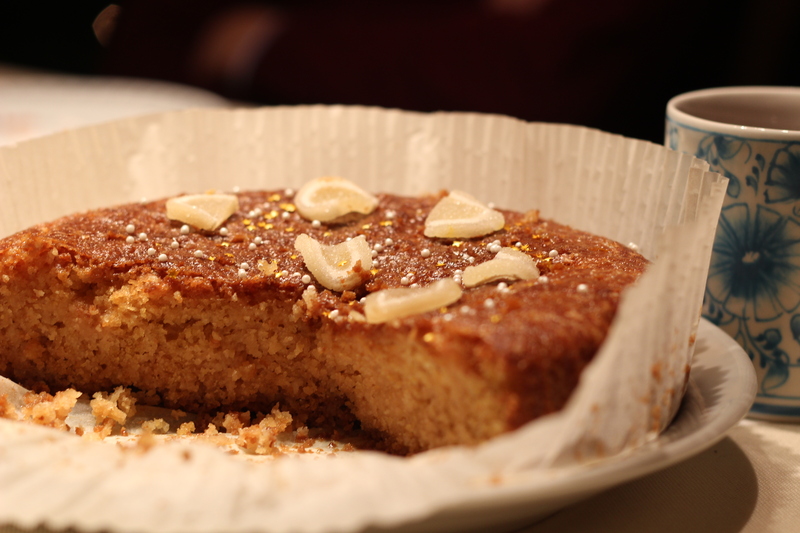 Don’t be tempted to use olive oil, it has a strong taste that will come through in your finished cake). Briefly stir so everything is combined without overmixing. Pour the mixture in the cake tin and level the top with the back of a spoon. Bake for 40 min or until a skewer inserted into the centre of the cake comes out clean. Cover loosely with foil for the final 5-10 min of the top starts to brown too quickly. Remove from the oven and let it cool briefly in the tin before turning out onto a wire rack. While the cake is in the oven, make the lemon syrup. Tip 85 g caster sugar into a small saucepan with the lemon juice (of the 2 lemons you zested before) and 75 ml of water. Heat over a medium heat stirring occasionally until the sugar has dissolved. Increase the heat and boil for 4 min until slightly reduced and syrupy. When the cake is on the wire rack, poke it all over with a skewer and slowly spoon the syrup on top in 2 batches so it can soak into the cake (you may want to put your wire rack over a sheet of cling film to avoid washing all the syrup of your counter top). If you prefer a crunchy topping instead of a sticky one, use 1 tbsp less caster sugar for the syrup and sprinkle that over the cake after you soaked it. Or dissolve the sugar in the lemon juice without adding the water and without heating it. Enjoy while listening to Lemon Tree by Fools Garden. Use up leftover polenta in a polenta, orange and blueberry loaf. Leftover lemons are great in hazelnut and lemon madeleines, a lemon and poppy seed loaf or a lemon cake. 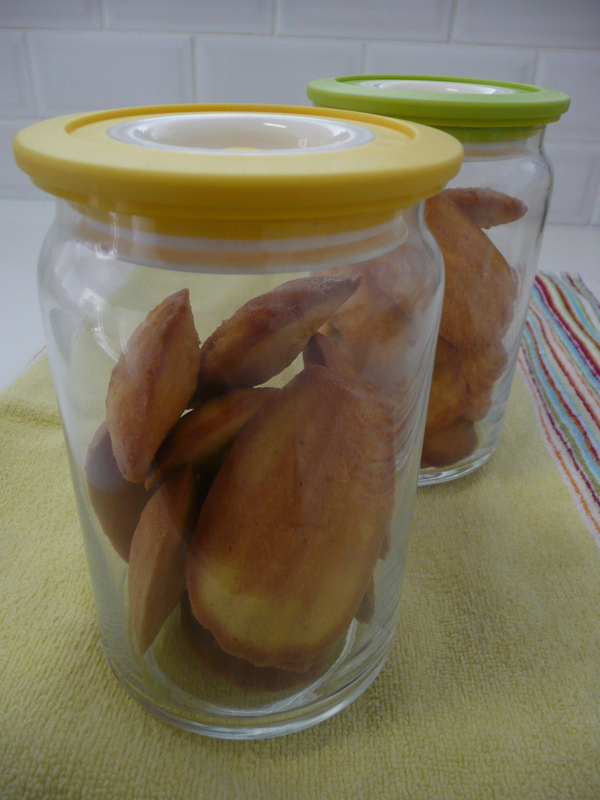 These madeleines are totally delicious and always a success. They look absolutely great too, so they make a great gift! My dad is a huge fan, so I made them recently for fathers day. My mom said after dinner that she would love a madeleine, but my dad just said she couldn’t have any, they were all for him… This recipe comes from Lorraine Pascale‘s Baking Made Easy and it’s really not that hard. All you need is a madeleine tin, which you can find anywhere really. Preheat the oven to 180 C and oil the madeleine tin with vegetable oil. Put 4 eggs in a large bowl and whisk until they have almost doubled in volume, then, while still whisking, gradually add 100 g caster sugar down the sides of the bowl. This will take about 10-15 min with an electric mixer (if you have a kitchen aid or anything like that, just use the machine, it’s so much easier! You can put the timer on 15 min, slowly adding the sugar in the first 5, and then do whatever you like in the mean time). The result will be a very light, fluffy and mouse-like batter. Add 80 g melted butter around the sides of the bowl so as not to knock out all the air, then add the seeds of 1/2 vanilla pod and fold the mixture over itself to combine, using as few strokes as possible. Add a pinch of salt and 100 g sifted plain flour in 2 batches and carefully fold it into the batter. Add 40 g toasted hazelnuts, finely chopped or ground (I use ground almonds, that works equally well) and the zest of 1 lemon and stir to combine. Spoon the mixture into the madeleine moulds until two-thirds full (the recipe suggests using a piping bag, but even though the mixture is very runny, I make it work with a spoon). Bake in the oven for about 10 min or until the madeleines are springy to the touch and are turning a light golden brown colour. Leave to cool in the tin for a few seconds, but not more, transfer them to a wire rack immediately or they will stick to your tin (I’m talking from experience here). Just push them gently on one side to slide them out. Eat them within two days or they will dry out (don’t worry, they won’t last that long!). Enjoy! Preheat the oven to 150 C and grease a loaf tin with butter, then dust it with flour. Or, if you’re lazy like me, buy baking parchment paper cases that fit your loaf tin. I got mine from Lakeland. Cream together 190 g softened butter and 190 g caster sugar with a mixer. Add 3 eggs one at a time, mixing well after each addition. You can sift all the dry ingredients together in another bowl and then add them in 3 batches, or, if you’re lazy like me, you don’t bother with sifting and other bowls, and you just add 190 g flour in 3 batches. After the second batch, add 25 ml milk (the recipe calls for whole milk, but we only ever have semi-skimmed and that works just fine). With the final batch of flour, add 1 tsp baking powder, 1/4 tsp salt, 4 tbsp poppy seeds and the zest of 2 lemons with the final batch. I also added the juice of half a lemon for a bit more of a lemon taste (I really do love lemons). Increase the speed and keep mixing until the batter is smooth and even, then mix in 80 g ricotta cheese (this will keep the loaf moist and rich). Pour the batter into the prepared tin and bake in the oven for 50-60 min until a skewer inserted in the middle comes out clean. Leave to cool in the tin before turning out onto a wire rack. The recipe suggest topping the cake with a soaking syrup when still hot (made by boiling the juice of 1 lemon with 50 g of sugar and 100 ml water until reduced by half) but I find that way too sticky. You can go for a lemon glaze instead, just mixing the sugar with the lemon juice and spooning that over the still hot cake or you can do what I did and opt for a lemon icing instead. For that, first cool the cake, then mix half an egg white with the juice of half a lemon and lots of icing sugar (you really need lots of it, you want it to be quite thick and not very runny anymore) and spread it over the cake. 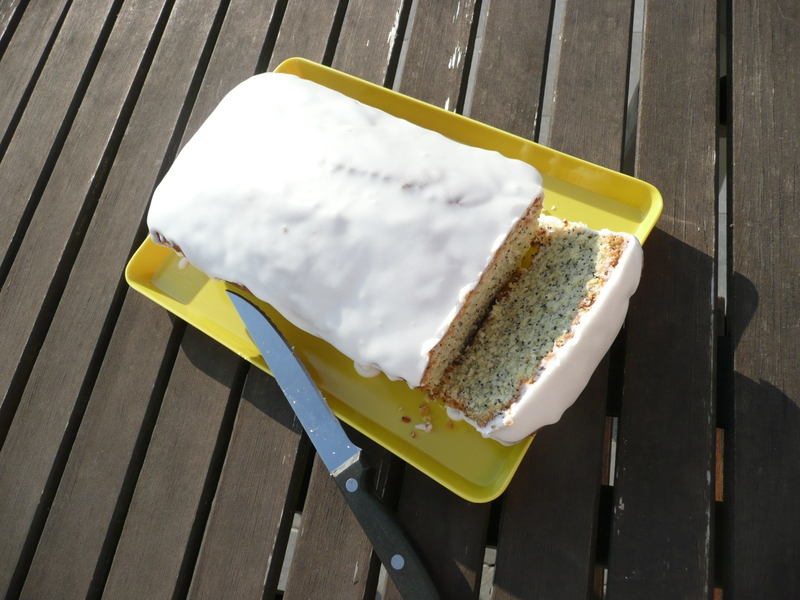 This is a basic icing recipe, I only increased the lemon juice for that lemony flavour. If you want regular icing, just mix an egg white with lots of icing sugar and only add a few drops of lemon juice (you need that to make sure it hardens, you can replace it with a few drops of vinegar as well). Enjoy!